Deepa Muthukumarasamy, is the Founder and CEO of Some More Foods that manufactures and delivers Organic convenience foods in the brand ‘Some More’ and Organic baby food in the brand ‘First Spoon’. Deepa belongs to Tiruppur, a textile town which is 60 kms from Coimbatore in Tamilnadu. She has completed B.Sc. in Nutrition and Dietetics from PSG College of Arts and Science, Coimbatore and M.Sc. in Foods and Nutrition in Women’s Christian College, Chennai. 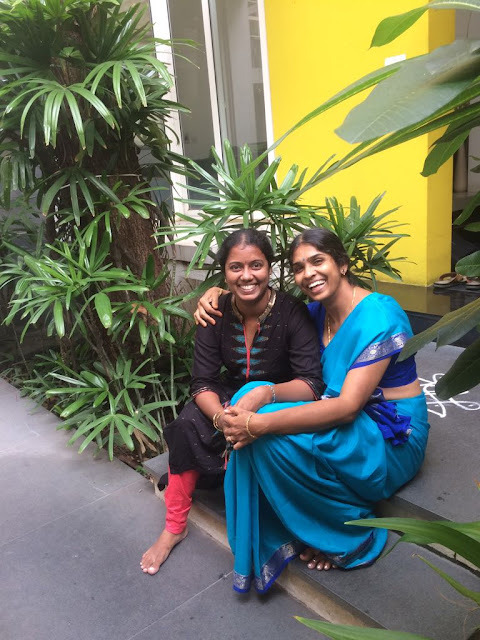 After college, Deepa worked with Accenture, Bangalore for few months and eventually she got married. She took the entrepreneurial plunge after she became a mother. To venture into food business was her passion and realizing the potential demand and benefits of organic health foods to the society, she decided to make Organic health foods. 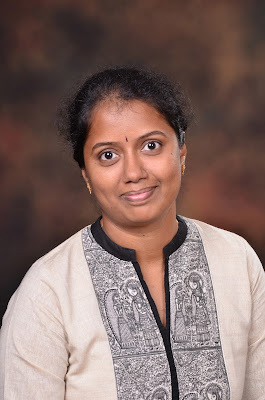 In an exclusive email interaction with The Motiverge; Deepa Muthukumarasamy, Founder and CEO of Some More Foods tells more about the venture and future plans. 1. Tell us more about Some More Foods. When was it established? 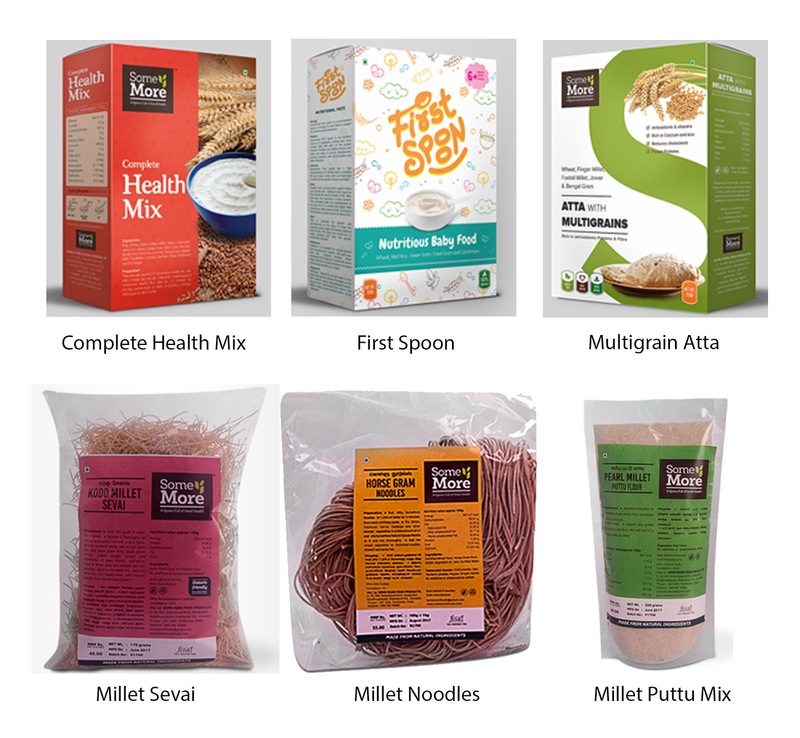 SOME MORE FOOD PRODUCTS was established in the year 2013 and we manufacture and deliver Organic convenience foods like Complete Health Mix, Multigrain Atta, Millet Noodles (9 Varieties), Millet Sevai (8 Varieties) and Puttu Mix (2 Varieties) in the brand ‘Some More’ and Organic baby food in the brand ‘First Spoon’. We are supplying to 100+ Organic stores in TamilNadu, a few paediatric hospitals and baby world outlets in Tiruppur. I started this venture along with my cousin Ms. Vidhya. However, due to some reasons she could not continue and it was ‘one-woman’ show from 2013. I saw my friends and relatives giving weaning (supplementary) foods to their babies which were store-bought. These were highly processed and were not completely organic. They were predominantly instant foods, that did not have ‘mummy’s’ personal touch. I used to make Health Mix at home using Organic ingredients for my son and I was helping my neighbours feed their babies too. They wanted me to make a fresh batch for them every month and were ready to pay me. I realized the market was in need of a simple convenient weaning food that a mother can confidently give her baby. I did a quick research and found that the market was abound with ready to eat baby food and they just have to be reconstituted with water/milk. There were not many which involved the traditional way of making the porridge. This was the biggest turning point in my life that changed my mind to become an entrepreneur. I have Kousalya in the team since one year. She has completed her Masters in Philosophy in Foods and Nutrition and was my friend in Women’s Christian College, Chennai while doing my masters. The journey of her entry started when I called her to suggest a name for our exclusive baby food. She administers and helps with formulating products at Some More Foods and writing content for our web page. Mr. Duraiswamy, a post graduate in Nutrition and Dietetics who holds experience in Food processing, and Technology. He helps in lending us Technical expertise in processing. Mr. Varun Gupta, Founder and CEO of Pro Nature Organics is my mentor through AIRSWEEE. He guides us with marketing strategies, distribution margins from the successful journey of perfecting his own business model and geographical diversity. We have hired a marketing team now to expand our business through online and offline marketing. 4. How Some More Foods is creating a unique one-stop platform to manufacture and deliver organic convenience food products at best prices? How does it work? At Some More Foods, we apply principles of nutrition to bring double benefit of balanced nutrition and organic simplicity meeting the nutritional requirements of babies, mothers and elderly people. We use traditional processing methods that minimize the nutrient loss. These strategies aim to increase the physicochemical accessibility of micronutrients, decrease the content of antinutrients such as phytate or increase the content of compounds that improve bioavailability. A combination of strategies is required to ensure a positive and significant effect on micronutrient adequacy. We have created an ecosystem to benefit the local farmers and our customers by providing chemical free organic health foods. We strive to provide best value products with a competitive edge on pricing. The journey has been very exciting so far with new challenges every day. Ours is a proprietorship firm. It was just my cousin Vidhya and me and later, just me. I developed the product by making numerous trials in my kitchen, which was then approved by a taste panel. I sought technical assistance from other food industries that has GMP/HACCP standards to manufacture our products. The distributor was a friend from my hometown Tiruppur who sold us organic ingredients from his shop and we reached around 100 organic stores through him and by word of mouth Dr Rajasekhar had placed his initial order and has been continuing ever since. I sought the help of my friends Dr Esther Selvaraj for developing the nutrition label for the products and Ms. Kousalya Sarangarajan for her understanding about foods and how nutrients work. It was a loose team in the beginning that was pitching in for me because of the personal relationships I developed over years. Being a first generation entrepreneur in food business, which has its own nuances, I was unaware of the means to nurture my venture and help it grow. Food business requires different marketing strategies and I was unaware of them too. But, I was constantly looking out for opportunities to grow. This year I heard about AIRSWEEE (All-India Roadshow on Women’s Economic Empowerment through Entrepreneurship) workshop by TiE and applied for the same and got selected to participate in a 3- day of workshop that guided us on various aspects of our businesses like making our BMC (Business Model Canvas), Marketing strategies and gave tips on how to scale up my business with the help of mentors. Now I am able to network better. I have started participating in expo and conferences to increase my visibility in the Food market. Keeping with times and as a marketing strategy, I had rebranded to increase the brand visibility. We have also launched new products and we are working towards expanding our business to other states and to have an active online presence too. In short AIRSWEEE is my GPS now that helps me navigate through my entrepreneurial journey. 6. What are the business opportunities in your sector, especially in the APAC region? Indian Organic food scenario is still in its infancy when compared to the global platform. India’s share in the $100 billion global organic food market is less than 0.2%. There is a good chance that India’s organic opportunity could scale from $500 million to 2billion – approximately $1 billion catering to domestic market and 1$ billion to export market by 2020. Indian organic food sector is proposed to develop and we will soon reach global heights. 7. According to you, what are the major health benefits of eating organic foods? Organic foods have more nutritional superiority than non-organic counterparts. Organic varieties do provide greater levels of Vitamin C, Iron, magnesium and Phosphorous. Recent research suggests that choosing organic food can lead to increased intake of nutritionally desirable antioxidants and reduce exposure to toxic heavy metals. ‘Organophosphorous’, an unnatural mineral compound in pesticide has been connected to a number of developmental problems including autism and ADHD. Herbicides and chemical fertilizer have been connected with various diseases like Cancers, Immune disorders, cardiac disease, infertility and numerous other diseases. Choosing Organic food helps children grow up healthy and unaffected by the toxins of the world during their developmental years. Organic food is often fresher because it does not contain preservatives that makes it last longer. 8. What are the challenges faced in your journey as an entrepreneur? How do you manage a work/life balance? The common factor that every women entrepreneur faces would be gender bias. The opposition normally arises from one’s own household. They have to cross such barriers and societal taboos to venture and embark on an entrepreneurial journey. To wade in unknown waters and to reach new horizons one has to be brave and constantly motivated. It is very critical to empower women to emerge as a successful entrepreneur so that the entire society can be benefitted. This also helps them have a good mental stability and gives them the feeling of contentment. All the components in the business should fall in place and one has to always look out for the right things at the right time to work well. I have been lucky enough to have had the best of two worlds. One being my alma mater and the other was the mentoring through AIRSWEEE. Generally, women are known for multi tasking. I organize my monthly schedule and revise them by the hour. My day to day goals and being organized is the only mantra that keeps both my marketing team and vendors on their toes. I tune myself to deliver according to the market needs. We are coming up with products for nutritionally-vulnerable sectors like Infants, pregnant women, postpartum women and geriatric population. Currently we are doing research on baby foods to bring variations in First Spoon as well as working to launch new products in convenience food sector. Our mission is to bring back traditional foods to present food culture and promote eco-friendly wholesome organic nutrition and our Vision is to become synonymous with convenient organic nutrition finding its way into every meal. The need of the hour is to lead a healthy and holistic life. My initiative – ‘Some More Foods’ is to facilitate good lifestyle by embarking on an all natural organic diet. This responsibility shouldered by me is what keeps me going. Every entrepreneur should have ‘3Ps’ for their success which are ‘Persistance, Perseverance and Payoff’.